It is difficult to decipher whether Marie Curie is more famous as a scientist, or as a female scientist. Obviously, these two things are not mutually exclusive; but when Madame Curie was working, they may as well have been. While she was not the only female scientist in the field during her lifetime, women in science were still a rare sight in the late 19th and early 20th centuries, largely excluded from many of the major universities and laboratories. Yet Marie, through the simple fact of being industrious, brilliant and female, made great strides toward gender equality in the sciences. 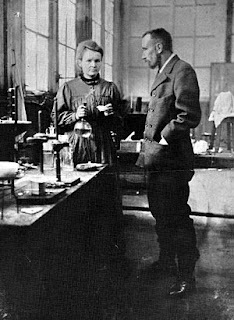 It would have been difficult to argue convincingly, even in a time when women were expected to stay at home and raise the children, that a scientist of Marie Curie's caliber ought to give up her important pioneering research because she happened to be female. "The goal is having as many women as possible in any pool of applicants so we can evaluate them according to their accomplishments, and hire the best person." As Marie Curie has proven, genius doesn't discriminate by gender; and with more intelligent, accomplished scientists, male and female, working and researching and inventing and making discoveries, the result can only lead to greater innovation--which is better for all of us.